Tragedy and Comedy in New England: Vaudeville at Poli's Palace - Springfield, Mass. A discussion of theatre in New England, from past to present, from backstage to balcony, from third row center. From memory. Vaudeville at Poli's Palace - Springfield, Mass. Above is the bill of acts for the Poli’s Palace in Springfield, Massachusetts in 1917. At this time, the Poli Palace was a vaudeville theater, but entrepreneur Sylvester Z. Poli was among the first to introduce movies to his theaters. So, right after Evelyn Elkins “singing comedienne” performs live, we are treated to a silent Western “Their Compact” starring Francis X. Bushman. The flickers and the “legitimate stage” share an audience, and presumably, worlds collide. We can’t be certain how progressive singing comedienne Evelyn Elkins was, but she was probably polite. 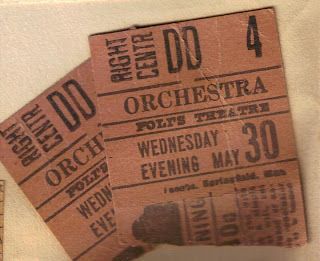 Will Rogers toured the Poli chain of theaters in 1908, and came to Sylvester Poli’s Springfield theater in February of that year. 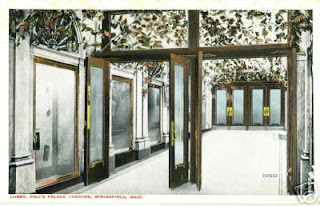 The theater was located at 286 Worthington Street, and after having its name changed to the Park Theatre in 1913, was destroyed in a fire in 1914. Poli was already busy building a new theater, called Poli’s Palace, a little farther down the street at 192-194 Worthington. This theater would continue as a vaudeville house, and after some years of sharing its audience with silent films, would eventually be turned over completely to that new medium when the talkies arrived, and Poli merged his chain with the Loew’s Corporation in 1934. Vaudeville had its own hierarchy of “top banana” comics, and lesser acts that “played to haircuts” (meaning people walked out on them, so all the performers saw was the backs of their heads). There were “small-time” vaudeville theaters and “big-time”. 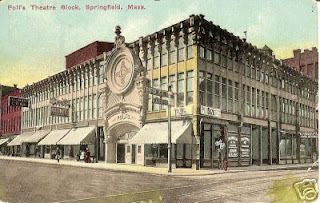 In Springfield, Poli’s would have been considered small-time, compared to the vaudeville acts that were booked for the more prestigious Court Square Theater in town, which would carry an odd week or two of vaudeville in between legitimate stage shows. The Shuberts, Keith, Albee and William Morris, all top vaudeville bookers who, regulated by the Vaudeville Managers Association, collected acts to run on the country’s regional vaudeville circuits. Springfield’s Pat Shea, one manager on the New England circuit, helped start the United Booking Office, a clearing house for vaudeville acts. 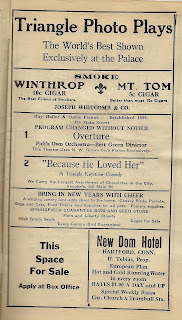 In February 1922, Shubert’s “High Class Vaudeville” played the Court Square Theater, and fifth on the bill was “Whipple and Huston.” Walter Huston, who later went on to movie fame, at this time played in comedy sketches with his wife, Bayonne Whipple. Over at Poli’s Palace, there were lesser known acts, like the Harvey-Devora Trio, which billed themselves as “Grotesque Singing and Dancing Novelty.” We cannot be certain if “grotesque” was added to attract attention, or was merely an honest assessment of their abilities. 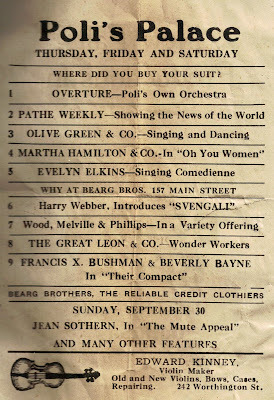 Spectacular acts were saved for last, “show-closers”, and on July 13, 1914, Gilmore & Castle, “Blackface Singing and Talking Comedians” (yes, they could also talk), were followed by show-closer Hassan Ben Ali’s Troupe. Box seats were 50 cents at the Poli’s Palace (orchestra seats were double that at Court Square), but if half a buck was still too steep, you could sit in the balcony for 10 cents. Sylvester Poli, incidentally, was among the first theater owners to construct a single cantilevered balcony in this building, built in 1913. 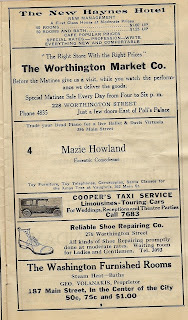 Vaudeville ran with a new bill every week at Poli’s from Labor Day through May 30th, when summer stock would take over. Poli had his own traveling theater group, called the Poli Players, that would tour his theaters. One future film actress to get her start with the Poli Players was Gladys George. The might be what’s known as having it all, but we never have anything for very long. Vaudeville was dead by 1930, and the talkies carried what would be known as the Loew’s Poli theater for the remainder of the decade and beyond, until that distant day when downtown theaters would be replaced by suburban cinemas. Later, Loew’s Poli showed first-run MGM films for another generation. Note: The photos of the exterior and interior of Poli's Palace are from postcards posted on the Image Museum site. The programs and tickets are from my collection. Welcome, Carol. Your grandfather's trophy is pretty neat heirloom. There's no way to specifically date the cup unless one were to read through old newspaper articles hoping to catch a glimpse of small notice. At this point, I can only give you a ballpark range. 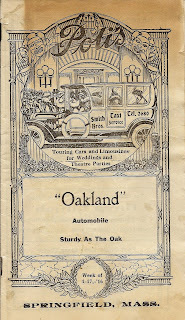 Sylvester Poli owned a chain of theaters in New England, and there were two in Springfield. The first one was called Poli's Palace. Throughout the 'teens and 1920s vaudeville played here, and silent films. In 1927, a newer, grander theater was built called the Poli Memorial Theater. In 1934 this theater became the Loew's Poli and thereafter pretty much showed just MGM films. The Charleston became a smash as early as 1923, but really became part of popular culture and well known around 1926 and 1927. Off the top of my head I would say the trophy was probably won no later than 1927, and most probably between 1926 and 1927. Again, the only way to definitively date it would be to search for a small newspaper notice. Good luck, and thanks for sharing this interesting bit of news. I am looking for any information regarding my great-grandmother, a vaudeville singer who performed from approximately 1919 to 1921 in Springfield, Mass. She may have performed under the stage name Delilah Paris or Lillian Paris. She may have also used the name Lillian Penney or Delilah Penney. Thank you in advance for any information you share with me. Thank you dropping by and sharing this bit of information on your great-grandmother. Off the top of my head I'm not familiar with her stage names, but I'll try to look around and see what I can learn. Perhaps another reader will know more. All posts on this blog are copyright Jacqueline T. Lynch and may not be reprinted without permission. Available in eBook or Paperback! Kindly have a look at my brother's cartoon blog: Arte Acher's Falling Circus. 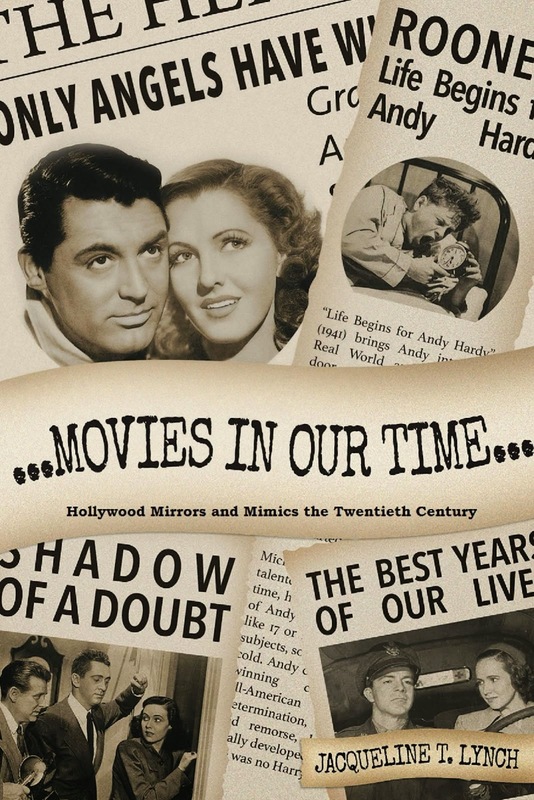 Hi, I was delighted to see Harold J. Kennedy mentioned in connection to Kitty Carlisle Hart in The Man Who Came to Dinner. Harold was a Holyoke native and wrote a book entitled No Pickle No Performance in which he mentions Kitty and many others with whom he worked in TV, movies, and theater. He spent many summers on the summer stock circuit and appeared also at Mount Tom in several productions, one with Cesar Romero and one with Katherine Houghton that I remember seeing. He also appeared with Gloria Swanson at Storrowton Theater in West Springfield. I have two stunning postcards ca. 1905-10 showing the theater in all its glory, one, a black & white photo shows it right across the street from the Boylston Subway Station. Tremont St. was two way and had only horse drawn wagons and many of them. Right next door was a big sign for Quaker Oats, as best as I can make out. I'd be glad to provide scans of both if you can figure a way. Very interesting views. Alicia MerrittJanuary 30, 2014 -- I am looking for any information regarding my great-grandmother, a vaudeville singer who performed from approximately 1919 to 1921 in Springfield, Mass. She may have performed under the stage name Delilah Paris or Lillian Paris. She may have also used the name Lillian Penney or Delilah Penney. Thank you in advance for any information you share with me. Thank you for this informative post! 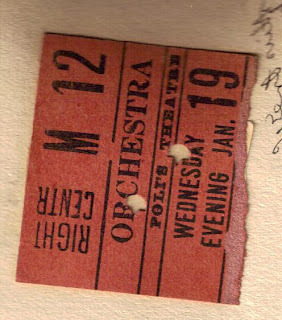 I have just read an old letter in which my mother tells my grandmother that she is attending this performance, Nov. 1944. My father used to work the concession stand in the casino and as a little boy, I delighted in sneaking into the theatre when the curtain went up and watched the actors from behind the seats. If caught, Carlton Guild could give a pretty nasty look and tell my father that I must stay out. But I found my way in...now years later, I wish I still had those programs that I so cherished.